✓ SPrivate meet and greet at the Juan Santa Maria (San Jose) International Airport. A full day of birding at the private reserve of Savegre Lodge. You’ll walk the trails and be entranced by the beautiful white oaks, and golden moss of this stunning forest. The array of bird species is astounding. In the afternoon, stroll along the river looking for dippers and phoebes and relax in the gardens surrounded by hummingbirds as the sunsets. Head south today, for the Pacific Coast and the small port town of Sierpe. Board your boat and make your way through the channels and mangroves of the Sierpe River. Be on the lookout for shorebirds and the elusive snowy Cotinga. The river gives way to the grand Pacific Ocean as you maneuver through the river mouth and out to the sea. Travel south along the coastline, watching for pelagic species and then to shore and Casa Corcovado. 2.5% of the world’s biodiversity calls Corcovado home. This pristine, dense, lush jungle exemplifies everything that nature lovers can imagine. Sultry weather brings plants to life, dark shadows hide jaguars and tapirs and over 100,000 acres of primary rainforest creates a paradise for birds (and bird lovers). Scarlet macaws, turquoise cotingas, bicolored hawk, and the blue-headed parrot are just a few of the “must have” birds found in the region. After breakfast, it’s back to the beach to board your boat and make your way back to Sierpe. Head north through the popular towns of Ojochal and Dominical to the Central Pacific. 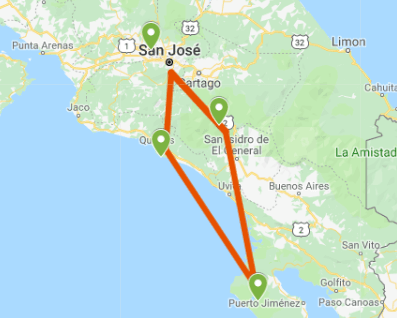 Your private guide will part with you hear so you can enjoy the beautiful beaches of Manuel Antonio and/ or book an optional tour. Enjoy this at leisure or plan for an optional tour. Be sure to explore the local restaurants. This area is well known for great restaurants overlooking the beautiful bay of Manuel Antonio. Your Costa Rican adventure comes to an end. Return to the San Jose Airport for your flight home.